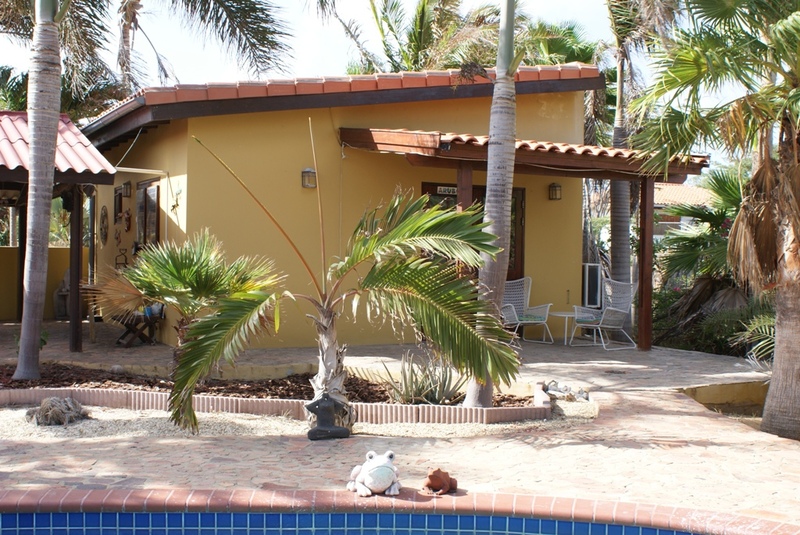 Casita “Aruba” is the largest apartment that we can offer to our guests. This casita has its own covered patio with a table and chairs, so your privacy is guaranteed. The apartment has a living room with a box spring (1.80m x 2.00m) of which possibly two beds can be made. The room is equipped with air conditioning and a television which is connected to the cable. There is also a safe for your valuables. The casita has an open kitchen and a separate bathroom, the shower has hot water. The kitchen is equipped with a gas stove with oven, microwave, dishwasher and a large fridge. There is enough kitchen utensils available, such as various pans, crockery, cutlery, coffee machine and so on. A simple cleaning kit and cleaning products are provided, as well as washing-up liquid. Casita “Aruba” is big enough so that an extra bed for a child between 2 and 14 years old can be placed for € 5, = per night. We also have a baby / toddler bed. Please be aware that your booking is only valid after we confirmed your request!